However, a bit of good news. In the middle of the week Mslexia contacted me about HOW I would like to receive payment for the short piece which I’d written to a prompt and which they had accepted for the March issue. Pay me anyhow, please. It’s just fantastic to be recognised. Usually, just having a piece placed brings on the cartwheels. Does that sound professional, Dear Reader? No, but I expect you have to earn a lot more than I do to be considered a pro. Over the last couple of days, I’ve started revisiting one of my old stories and considering – possibly – entering it for the same magazine’s short story competition, having vowed last year that I would never do so again, that particular comp being well out of my league etc etc. 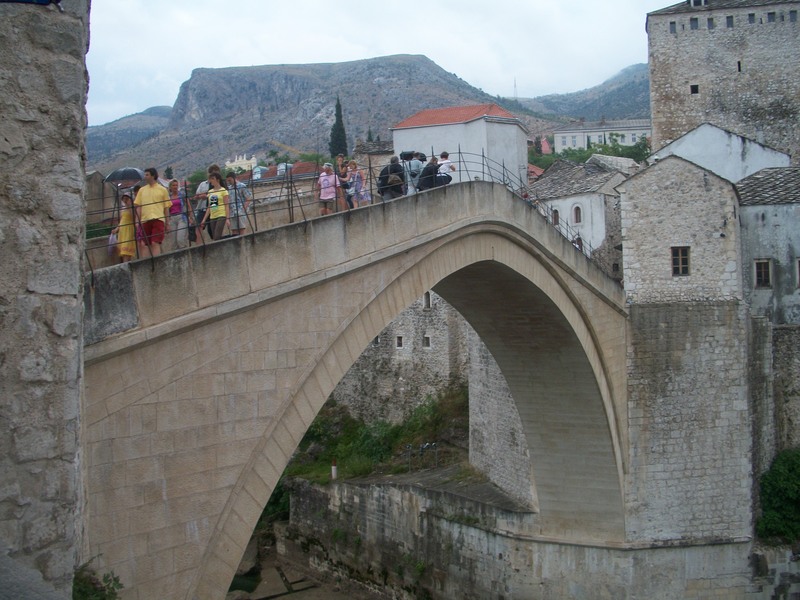 Without giving too much away, my story is set in Mostar, Bosnia, with much of the action taking place near the (new) Mostar Bridge, which has been rebuilt after Croatian shelling in 1993 – see the photo below, which is mine (or my husband’s). I know some writers depend on Google Maps and Google Earth, and I’ve even seen articles in writing magazines advising them to do this, but I never feel comfortable pontificating about places I haven’t visited. I keep telling my students that every piece they write must have a beginning, middle (with sub-headings, so I can mark it easily, Dear Reader) and an end, but it’s 11.10 and I haven’t posted the photo yet. So I’m stopping right NOW! I don’t think the cartwheels sound too unprofessional – (unless you film yourself doing them and post on Youtube and show everyone your knickers) If we’re not pleased to have our work accepted then what’s the point writing and subbing it? Sorry to hear you’ve been unwell. Hope you’re feeling better now? Fantastic news about your success at Mslexia. How can we read this? Do we have to have subscription to the magazine? Congrats on hearing about getting payment 😀 That must be nice. Great post.